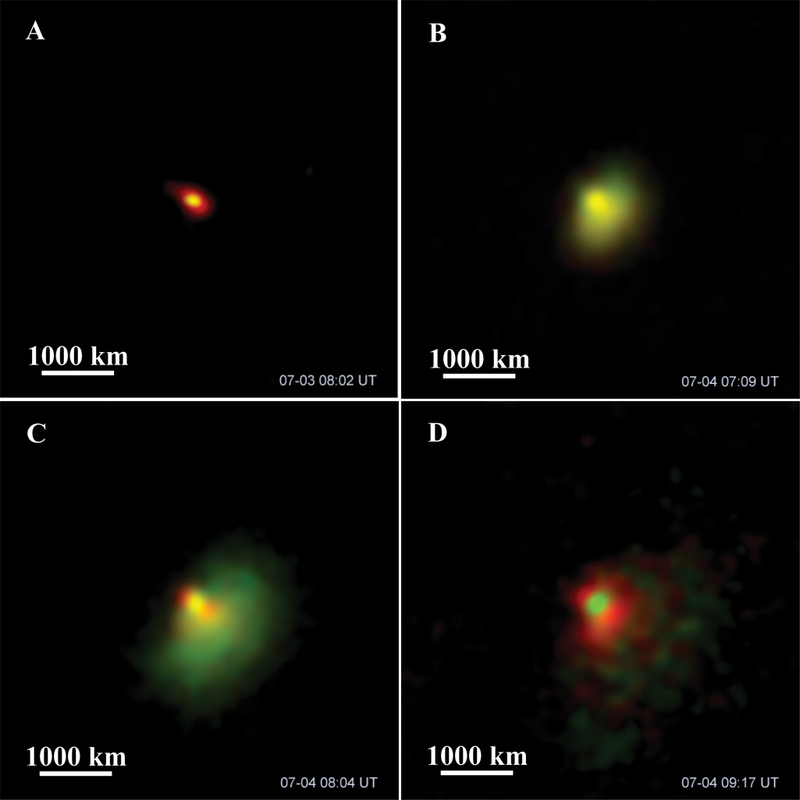 Coordinated observations of the collision of NASA's Deep Impact mission with comet 9P/Tempel 1 by the Subaru, Gemini and Keck telescopes on Mauna Kea delivered surprising new insights into the ancestry and life-cycles of comets. Specifically, materials beneath the comet’s dusty skin shows striking similarities between two families of comets where no relationship had been suspected. When NASA's Deep Impact mission ploughed into comet 9P/Tempel 1 on July 4th of this year, the giant telescopes on Mauna Kea had a unique view of the massive cloud of dust, gas and ice expelled during the collision. A series of coordinated observations, made under ideal conditions by the world's largest collection of big telescopes, delivered surprising new insights into the ancestry and life cycles of comets. Specifically, materials beneath the comet's dusty skin reveal striking similarities between two families of comets where no relationship had been suspected. The observations also allowed scientists to determine the mass of material blasted out by the collision, which is estimated to be as much as 25 fully-loaded tractor trailer-trucks. The findings are based on the composition of rocky dust detected by both the Subaru and Gemini 8-meter telescopes and ethane, water and carbon-based organic compounds revealed by the 10-meter W.M. Keck Observatory. The results from these Mauna Kea observations were made available today in a special segment in the journal Science highlighting results from the Deep Impact experiment. Comet Tempel 1 was selected for the Deep Impact experiment because it orbits the Sun in a stable orbit that allows its surface to be gently baked with solar radiation. As a result, the comet has an old weathered,protective layer of dust that covers the icy material beneath, much like a snowbank builds up dirt on its surface as it melts in the springtime sunlight. The Deep Impact mission was designed to dig deep beneath this crusty exterior to learn more about the true nature of the comet's dust and ice components. "This comet definitely had something to hide under its veneer of rock and ice and we were ready with the world's biggest telescopes to find out what it was," said Chick Woodward of the University of Minneapolis and part of the Gemini observing team. The combined observations show a complex mix of silicates, water and organic compounds beneath the surface of the comet. These materials are similar to what is seen in another class of comets thought to reside in a distant swarm of pristine bodies called the Oort Cloud. Oort Cloud comets are well preserved fossils in the frozen suburbs of the solar system that have changed little over the billions of years since their formation. When they are occasionally nudged gravitationally toward the Sun they warm up and release a profuse amount of gas and dust on a one-time visit to the inner solar system.. Returning comets like Tempel 1 (known as periodic comets) were believed to have formed in a colder nursery distinctly different from the birthplaces of their cousins, the Oort Cloud comets. The evidence for two distinct "family trees" lies in their vastly different orbits and apparent composition. "Now we see that the difference may really be just superficial: only skin deep." said Woodward. 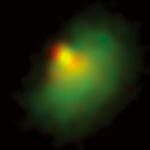 "Under the surface, these comets may not be so different after all. 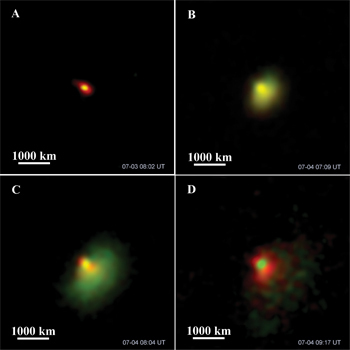 This similarity indicates that both types of comets might have shared a birthplace in a region of the forming solar system where temperatures were warm enough to produce the materials observed. "It is now likely that these bodies formed between the orbits of Jupiter and Neptune in a common nursery," said Seiji Sugita of the University of Tokyo and Subaru team member. "Another question that the Mauna Kea telescopes were able to address is the amount of mass ejected when the comet was impacted by the chunk of copper about the size of a grand piano from the Deep Impact spacecraft," Sugita commented. At the time of impact the spacecraft was traveling at about 23,000 miles per hour or nearly 37,000 kilometers per hour. Because the spacecraft was unable to study the size of the crater created after it was formed, the high-resolution Mauna Kea observations provided the necessary data to get a firm estimate of the mass ejection, which was about 1000 tons. "To release this amount of material, the comet must have a fairly soft consistency," Sugita said. "The splash from NASA's impact probe freed these materials and we were in the right place to capture them with the biggest telescopes on Earth," said W.M. Keck Director Fred Chaffee. "The close collaboration among Keck, Gemini and Subaru assured that the very best science was done by the best telescopes in the world, demonstrating that the whole is often greater than the sum of its parts." All three of Mauna Kea's largest telescopes observed the comet in the infrared part of the spectrum which is light that can be described as "redder than red." The Deep Impact spacecraft was not designed to observe the comet in the mid-infrared (or thermal infrared) part of the spectrum, which is what Subaru and Gemini were able to do. The Keck observations used a near-infrared, high-resolution spectrograph. Large instruments of this sort would have been impossible to fit on the Deep Impact spacecraft. "These observations give us the best glimpse yet at what's under the dusty skin of a comet," said David Harker who led the Gemini team. 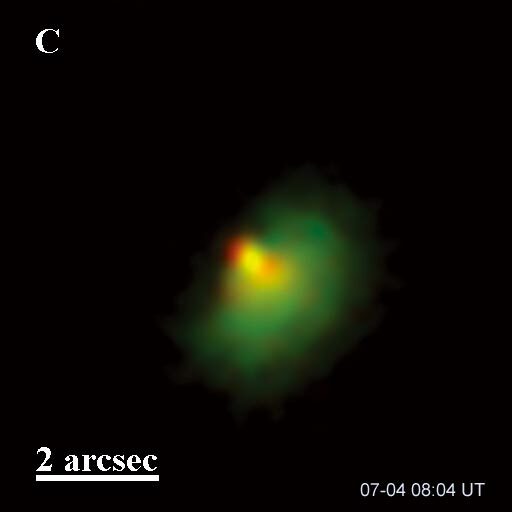 "Within an hour of impact, the comet's glow was transformed and we were able to detect a whole host of fine dusty silicates propelled by a sustained gas geyser from under the comet's protective crust. These included a large amount of olivine, similar in composition to what you would find at the beaches below Mauna Kea. This incredible data was really a gift from Mauna Kea!"